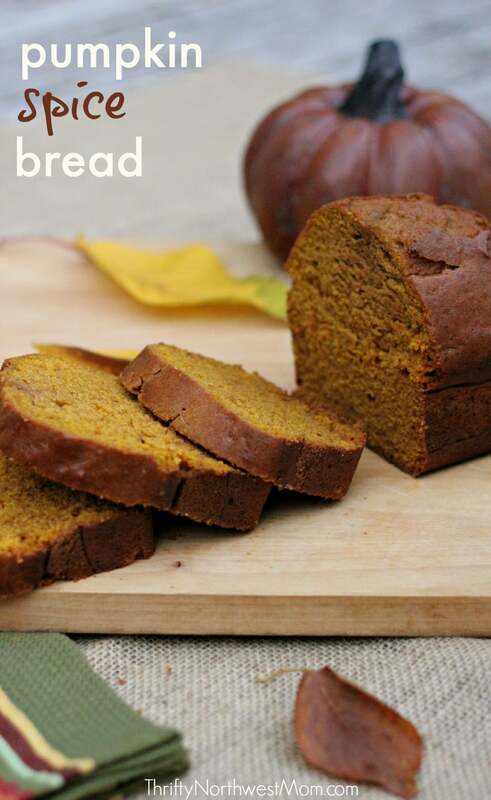 This Pumpkin Spice Bread Recipe is a delicious & moist bread perfect for fall gatherings or parties. I am a person who absolutely loves bread, especially homemade breads such as zucchini bread, banana & pumpkin bread! Yum!! Especially the smell of your kitchen while they are baking. So, I just love the fall as it’s definitely the season for baking these yummy goodies! I wanted to share with you a recipe I received from my mentor mom at MOPS a few years ago. It’s for a delicious, moist Pumpkin Spice bread! I have to tell you that this was seriously some of the best pumpkin bread I’ve had – so incredibly moist & tasty!! This recipe makes two regular sized loaves of bread or 6 – 8 mini loaves (or more, depending on the size). Preheat the oven to 350 degrees (325 degrees for mini loaf pans) and heavily grease your loaf pans. Combine flour, soda, salt, cinnamon, nutmeg and sugar in a large mixing bowl. In a medium bowl beat the eggs. 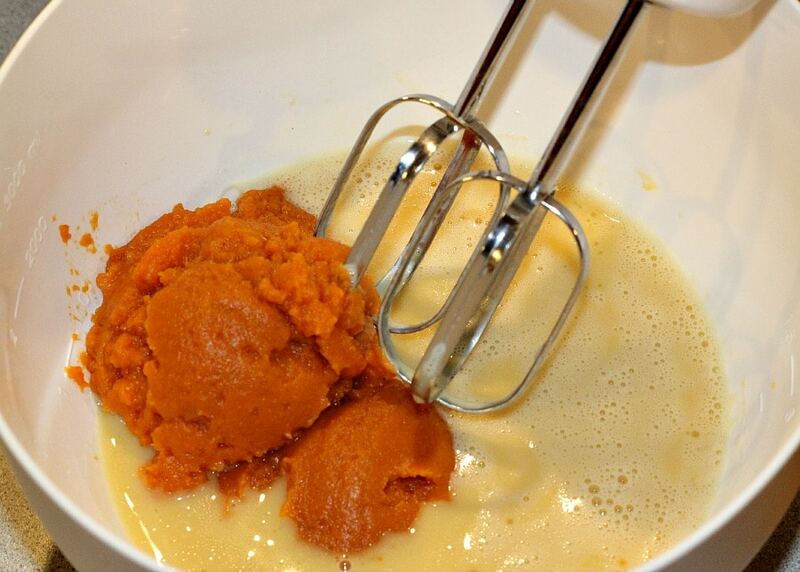 Then add in the water, vanilla, oil & pumpkin puree & mix. Add the pumpkin mixture in to the flour mixture & stir with a spoon. Stir until well blended. Add the roasted pecans (we’re not fans of nuts in our breads, so we leave those out, but it does give it a nice flavor). Pour into the prepared loaf pans. Bake for 1 hour (40 minutes or until firm for the mini loaf pans). Place the pans on a rack and let cool for 10 minutes. Remove the bread from the pan and let cool on a rack until at room temperature. The bread seasons best if chilled overnight and then served at room temperature the next day. Although I always love eating it warm, fresh out of the oven, too! As I mentioned earlier, I first tried this recipe when my MOPS mentor mom gifted the ladies at my table with this yummy bread. This was such a fun gift for all of us ladies, as she found these adorable, seasonal mini loaf ceramic pans for $1 at Michael’s with a fun, fall theme! 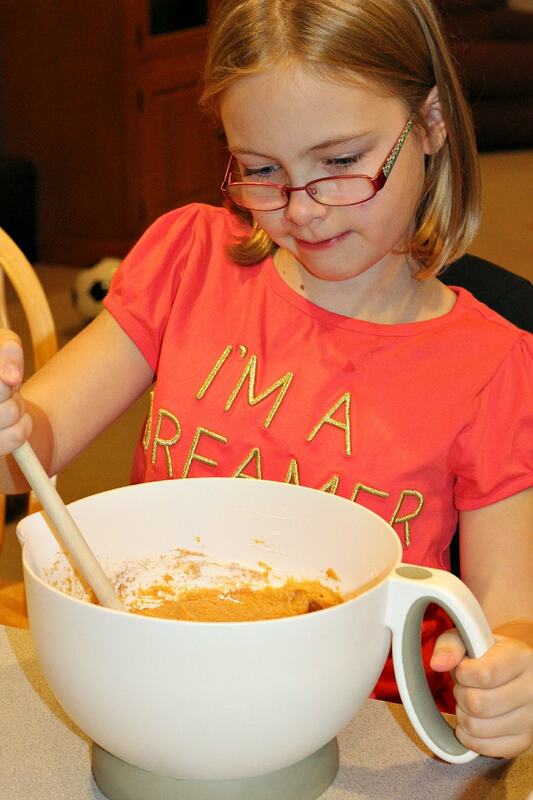 She then packaged up the pumpkin bread with a pretty ribbon and attached the recipe which she’d printed out! She said they also offer these during other seasons as well, so I thought this was such a perfect little, frugal gift idea! We enjoy passing out goodies to our neighbors at Christmastime – we find it’s a great way to reach out to them and get to know them a little better. And I thought this was a fun idea to bake them a small loaf of bread (pumpkin, zucchini, banana, friendship bread & more) and deliver it in a cute little mini loaf dish that they can keep! This would also make a nice gift to give at a gathering, bring as a thank-you gift for the hostess of a get-together, or give at Thanksgiving with friends or family. It is a frugal gift as these little dishes are only $1 (you could also look for a larger dish if you wanted to make something bigger), add the bag, ribbon, and homemade bread and you have an inexpensive but meaningful gift!! If you’d like to make the mini loaves much quicker, check out this mini loaf pan which can bake 8 loaves at a time. That’s a way to crank out a bunch of mini loaves for gift ideas. Another fun idea – a friend gave me a small pumpkin & attached the pumpkin bread recipe on a little card to the pumpkin. They could then use the pumpkin to make the pumpkin bread! My Secret Sister attached a cute little hand-crafted card with the recipe on the back! Such a fun gift to receive – perfect for this time of year! Preheat the oven to 350 degrees (325 for mini loaf pans) and heavily grease your loaf pans. Combine flour, soda, salt, cinnamon, nutmeg and sugar in a large mixing bowl. In a medium bowl beat the eggs. Add the water, vanilla, oil, and pumpkin puree. Bake for 1 hour (40 minutes or until firm for the mini loaf pans). Place the pans on a rack and let cool for 10 minutes. Remove the bread from the pan and let cool on a rack until at room temperature. Bread seasons best if chilled overnight and then served at room temperature the next day. 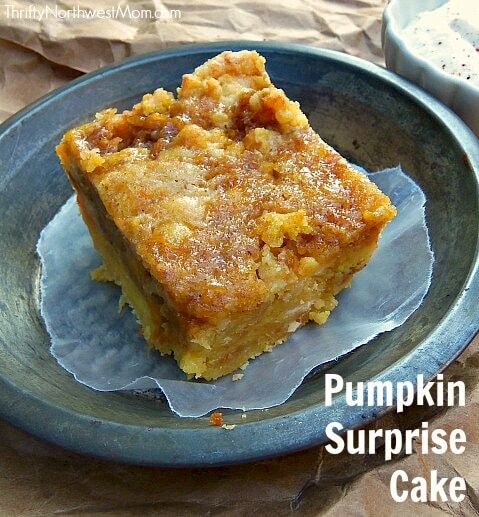 Jen- my hubby and I made this last night w/ fresh pumpkin puree from our pumpkins we carved yesterday and I just have to say… that is SOOO good! Definitely the best pumpkin break I've ever had. Thanks for sharing! Oh good!! I thought it was so delicious & moist – thought others would enjoy it, too! Glad you enjoyed it! :) I'm going to make it myself this week! Thanks! Our first pumpkin treat of the season. I think it would have even made 3 regular sized loaves since I put it in only 2 pans and it started to burn the outside before it was cooked through. Yum! Great idea putting them in those cute pans!